I picked up this old sulfated Daimler Chryler Corp. 500 cold cranking amps from Auto Zone. Their battery tester indicated standing voltage of 11.20, but under load it dropped instantly to 2.50. Obviously, a worthless battery. 8/20/07 Started my independant testing using a Renaissance Charger 2A12. 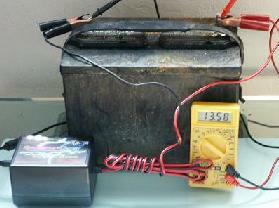 8/20/07 Test 1: After first charge cycle, the battery read 12.67 standing voltage; it operated under load of 75 watts for a duration of 1.49 min. and the inverter dropped out at 9.74 volts terminating the test. 8/21/07 Test 2: After second charge cycle, the battery read 12.51 standing voltage; it operated under load of 75 watts for a duration of 5.0 min. and the inverter dropped out at 9.70 volts terminating the test. 8/21/07 Test 3: After third charge cycle, the battery read 12.68 standing voltage; it operated under load of 75 watts for a duration of 8 min. and the inverter dropped out at 9.74 volts terminating the test. 8/22/07 Test 4: After fourth charge cycle, the battery read 12.50 standing voltage; it operated under load of 75 watts for a duration of 5.09 min. and the inverter dropped out at 9.74 volts terminating the test. 8/22/07 Test 5: After fifth charge cycle, the battery read 12.57 standing voltage; it operated under load of 75 watts for a duration of 7.11 min. and the inverter dropped out at 9.72 volts terminating the test. 8/23/07 Test 6: After sixth charge cycle, the battery read 10.96 standing voltage; it operated under load of 75 watts for a duration of 170.45 min. and the inverter dropped out at 9.75 volts terminating the test. 8/24//07 Test 7: After seventh charge cycle, the battery read 10.58 standing voltage; it operated under load of 75 watts for a duration of 166.01 min. and the inverter dropped out at 9.74 volts terminating the test. Although there is no solution to reconstituting a shorted battery cell, a severely sulfated battery can be “Radiantly” charged back to a near new condition. Conventional chargers cannot break through the sulfated layers that normally form through conventional charging and discharging cycles. After becoming so sulfated they can no longer be charged, most old batteries are recycled or discarded as worthless. Our innovative new process now makes it possible for you to recover these unchargeable batteries, with replacement costs typically between $60.00 to $6000.00 depending on your battery type. We have recently developed several different charging systems which are unique and available to different market segments for industry and consumers alike. Radiant charging technology will ultimately save you money by providing a more powerful charge and increased productivity. With all of us now looking to help the environment, Radiant charging greatly reduces the amount of wasted energy, normally consumed in conventional charging. This is all due to the constant sulfation build-up that normally occurs through the battery’s cycling process. Whether your are a fleet operator or consumer, Radiant charging is the next evolution in battery maintenance that makes a difference. The new Genesis 36/48-Volt golf cart and NEV charger are the latest technology in Radiant charging. The model 1100 automatic battery charger delivers a 20-amp output and is microprocessor-controlled. Features include voltage selection, automatic shutoff, anti-sparking, short circuit and polarity protection. Special circuitry has been incorporated to maintain the battery over extended times of none use, keeping the battery at its optimum charge density. There is no better charging system on the market today to maintain old or new batteries to their optimum performance levels. Daily use of the Genesis Charging System on new batteries will keep them working like new and old batteries will become like new after repeated cycling. This all equates to longer run times and extended battery life. The amazing effects of Radiant charging will result in less energy consumption, less battery recycling and 30% or more available stored power. Weighing in at just 88 lbs., this titan forklift charger operates on just 110/120-volts AC @ 30 Amps, unlike massive chargers that require 220/240-volts 3 phase AC commonly used. This amazing charger can charge an un-chargeable (severely sulfated) battery, that cannot be conventionally charged and is ready for recycling. The above pictures represent a 1000 amp-hour highly sulfated forklift battery, that could not be conventionally charged. In just six cycles we can clearly see that the sulfation has started to break-up and is returning active material to the battery plates. This battery is currently operating at over 50% of its original capacity, and will continue to increase over repeated cycling. Unlike any other charging systems, this battery can now be placed back in service and run a complete eight-hour shift before recharging is necessary. With continued charging and discharging cycling the Radiant charger will slowly break through the sulfated layers until the battery reaches its optimal performance level. 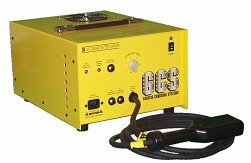 This new compact (4 1/2″ L x 3″ W x 2 3/4″ D) battery charger incorporates state-of-the-art Radiant technology, specifically design to be use with 12-volt lead-acid and deep-cycle batteries. This new charging methodology sports some of the same features as the industrial chargers, features include automatic shutoff, anti sparking, short circuit protection, battery maintenance and polarity protection. Extensive testing has shown that this little charger out performs any of the rival competition in its class. With the use of Radiant technology it will easily charge unchangeable batteries and maintain good batteries to their peak performance, while providing a denser charge. The above graph indicates how much more capacity the battery can hold after just one week of use. This was compared to a national brand charger in a laboratory controlled environment. Although all batteries degrade over time and use, Radiant charging slows this process down considerably, resulting in energy savings and battery longevity. There is no substitute for Radiant charging, especially when the need arises for that extended run time and battery reliability. This is especially true with common start batteries (cold cranking amps CCA), which are comprised of mainly thin plates, that deteriorate rapidly under normal use and conventional recharging. Radiant charging takes advantage of the battery’s own natural conversion process to help restore the negative effects of rapid discharging, which causes sulfation build-up to occur. Radiant charging is ideal for battery maintenance, by periodically charging the battery once every several months to help remove excess build-up of sulfation and restore the battery’s natural balance. Whether you are charging start or deep-cycle batteries the results are the same, Radiant charging provides benefits that can save you energy and prolong the battery’s life cycle to meet or exceed its manufacture’s warranty. 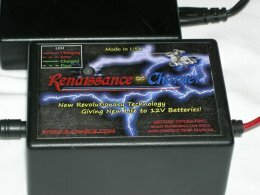 To purchase or receive more information on the new product visit Renaissance Charge LLC, and prepare to be amazed. The primary objective for ENERGENX is the development and introduction into the market of highly efficient energy systems. These systems use an innovative new technology to enhance the chemical process in lead-acid and gel-cell batteries. In-house testing has been conducted on many different models to determine the optimal performance levels and power output, while using significantly less input to generate the system’s output. Although, the motor/generators remain a continued research and development project, we are confident that one day these motors can be used in a wide variety of energy conserving products that require far less energy to operate. Small scale models have been built to prove the principles of this technology. They can perform a variety of tasks, such as, pumping water and running fans, while also having the ability to tap off additional energy for instant consumption or diverted to storage batteries for later use. Engineering and product development on the solid-state charger models continues to dominate the company’s current list of objectives for 2007. Radiant charging technology will take many forms, in a variety of products, now being developed and tested. Fully automated Industrial chargers are designed to meet the operational needs of fleet, warehouse and individual use applications. State-of-the-art safety features are part of the design process, which will eliminate user/operator error during the charging process. Radiant battery charging technology can be adapted to specific products. These designs will meet the needs of existing or emerging markets, with charging systems that use less energy and help extend battery life. With energy being one of the defining issues of this century, Energenx technology and designs will help to conserve energy and promote cleaner air. Batteries in all shapes and forms will dominate the market as industry’s clean energy source. Energenx is continuing in-house testing of the new Solar-Kick Charge Controller System. We have integrated both solar and wind power into dual battery banks, which are also controlled by the Radiant charge controller. This new innovation, seamlessly switches between battery banks to provide uninterrupted power. We believe this bold new concept will one day dominate the market, by producing far more energy than conventional solar charge control systems. In-house demonstrations provide hands-on use of this highly innovative technology. Both professional and laypersons alike, agree that the technology can be adapted to a wide verity of products and market segments. One of the most debilitating effects for electric vehicles is battery sulfation. This effect over a years time can rob your car of almost 40% of its battery capacity, significantly reducing round trip mileage. Energenx plans to introduce and field test several model charging systems that will address these negative effects, and improve battery performance, and increasing electric car mileage. # The Problem: The average life of a liquid filled battery, depending on usage, is 6 to 48-months. According to a recent study, only 30% of all batteries actually reach the 48-month point. Deep-cycle batteries run significantly longer. Sulfation buildup occurs as lead sulphates form on the battery plates during the normal charge and discharge cycles. During this process, some of the sulphates enlarge to the point where they can’t accept energy so they stay on the plate. Over time these sulphates can build up until efficiency is reduced and the battery dies. This process is the main reason for over 80% of all battery problems and failure. It is a natural by-product of battery operation and sooner or later it will kill your battery. This is especially true for infrequently-used and stored vehicles, but it is also a major problem for frequently-used vehicles. Undercharging and Overcharging: If the battery is not completely recharged after each use, sulfation buildup increases slightly with each charge/load cycle and impedes the battery’s ability to be charged and/or deliver power. If the battery is overcharged, the battery will heat, causing excessive thermal expansion and contraction. This causes damage to the internal structure of the battery, causing it to fail as well. Radiant charging incorporates several innovative design technologies which minimize both undercharging and overcharging problems. # The Solution: The Company has recently finished the product development (including extensive testing) of a new solid-state battery charging system called the Radiant Battery Charger. This charger is designed to charge heavy-duty traction batteries such as those used in golf carts and electric forklifts to a higher capacity level than is possible with conventional or pulse charging equipment. This is accomplished through a specially designed de-sulfating process that naturally occurs in the Radiant charging process. Although there are many different pulse charging systems on the market, all of which claim to provide a better and deeper charge, they still cannot compare to the new Radiant charge. The Radiant charge, unlike all others can effectively bring back an un-chargeable battery (over sulfated condition) to an almost new condition, and in some cases better than new. This is possible through a revolutionary process called Radiant technology, which is unconventional in nature, but provides the battery time compressed energy to enhance its charging capability and promote de-sulfating. A battery plate with good conductivity can be maintained to its optimal performance with regular use of the Radiant charger. ENERGENX will continue with the development of additional products to complete the evolution of battery charging product lines. Specially designed chargers that accommodate both 36 and 48-volt battery charging requirements, so that battery chargers can be delivered for all needs in a rapidly evolving market for batteries in stationary or mobile applications. # Innovations : Energenx has recently designed a fully automatic 36-48-volt switch mode radiant charging system for both the golf cart and forklift industries. These new chargers incorporate state-of-the-art micro processing controlled functions and continuously monitor the battery. With these new innovations there is no chance of undercharging or overcharging the batteries. The charger has a number of other advanced features including automatic short circuit protection, reverse polarity detection and series of LED’s to indicate charging status and battery fault conditions. Radiant charging is optimized to allow batteries to except more energy, thus improving their performance and extending the life cycle. Radiant charging produces far less heat than conventional charging, which actually wastes energy trying to push electrons onto a sulfated battery plates. When this happens, excess heat is the result and over time the battery plates begin to warp and buckle. Productivity And Energy Savings : Hundreds of millions of dollars are lost every year in battery replacement and lost productivity. This is all attributed to the improper charging of batteries from conventional chargers. The Radiant charging system will actually save you money, while keeping your golf carts or forklifts continuously running with a powerful charge. With increased battery power, the productivity will be easily recognized. Charging down time and wasted energy will be virtually eliminated. This could represent savings as much as 30% of your annual battery replacement and energy costs combined. Using any of the Radiant charging systems actually helps the environment by reducing wasted energy usage and premature battery recycling. # Background: ENERGENX, INC. has developed core technologies based on an electromagnetic hybrid motor/generator, and on a new methodology for an improved charging process for batteries. This technology is used for the development of new energy supply systems, battery charging systems, and a new generation of electrical motors/generators. The hybrid motor/generator utilizes a scientific concept which has been named Back EMF Permanent Electromagnetic Motor/Generator by the inventor, John Bedini. Over many years, John C. Bedini, Vice President for R&D of ENERGENX, and the inventor of the “Bedini Motor/Generator” and the “Solid-State System”, has developed the patented Motor/Generator as well as of a solid-state system as a new way of charging batteries. Upon its formation, ENERGENX has been assigned by, and has acquired from, John Bedini, the exclusive rights to these patents, and any subsequent patents. In the course of the development of a highly efficient energy generation system, different ancillary products have emerged. The functioning principles can be characterized as follows: (1) Instead of conventional DC charging, batteries can be charged much more efficiently by voltage/current pulses with specific shapes and frequencies which trigger a chemical and energy absorption process resulting in the reconfiguration / recharging of the battery. The energy available in the battery after charging is substantially larger than the energy used by the pulses. (2) This special pulse charging can be done either by means of a specially configured Bedini Motor/Generator or a particular Solid-State Circuitry with an induction loop. In both cases, a primary battery (or power supply from an electrical outlet from the Electrical Power Company) serves as the primary source for the amount of energy necessary to supply the primary energy for the Motor/Generator or Solid-State Circuitry. The Bedini Motor/Generator uses the well known electrical principle of induction in an innovative way through timing triggering and reversion of the direction of the magnetic field, which, together with the use of a form of energy which is different from the conventionally known electrical energy. The newest version of such 10-polar motor is shown in the enclosed picture. It shows the rotor with embedded permanent magnets in the center of the motor, and the parallel primary and secondary windings on the coils located on the outside of the motor. The result is a motor/generator which has a higher efficiency than conventional electrical motors or generators. Many different prototypes of this new type of motor/generator have been built, but up to now mainly with emphasis on its use for the purpose of the energy supply system. This has generated a very thorough knowledge about the operating principles of the motor. It has also been established, however, that the motor while being used for the energy supply system also develops mechanical energy, which could be used for other purposes, such as pumping water. Because of the indigenous characteristics of extremely high efficiency, the motor will find many other applications. U.S. Patent 6,392,370 issued May 21, 2002 for a “Device and method of a back EMF permanent electromagnetic motor generator”. Expires January 12, 2020. U.S. Patent 6,545,444 issued April 8, 2003 for a “Device and method for utilizing a monopole motor to create back EMF to charge batteries”. Expires March 13, 2021. U.S. Patent 6,677,730 issued January 13, 2004 for a “Device and method for pulse charging a battery and for driving other devices with a pulse”. Expires December 21, 2021. Currently the company has one Patent Pending and is in preparation of filing additional patents.